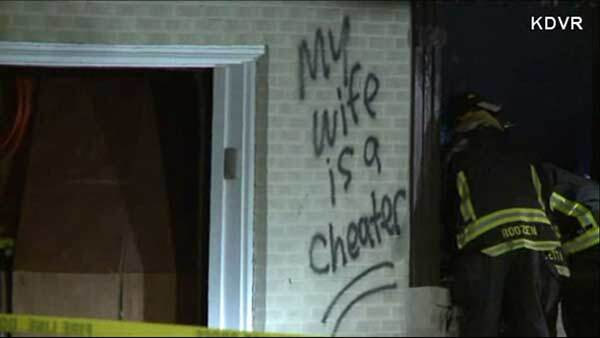 ARVADA, CO -- Someone spray painted ''My wife is a cheater'' on a home that exploded and caught fire in Arvada, Colorado early Tuesday. Firefighters arrived at the home at 6854 Nelson Street at 1:30am and found it completely engulfed in flames, according to the Arvada Fire Department. Debris found in the street indicates there was an explosion, but it is too early in the investigation to determine a cause, said Deanna Harrington with the AFD. A neighbor said it was "chaos" immediately after the explosion, with everyone trying to find two children who live in the home. A family member later confirmed all occupants were out of the home. There are no reports of any injuries. The home suffered extensive damage inside, according to Harrington. No neighboring homes were damaged by the fire or explosion, KMGH-TV reported. Arvada police say they are searching for a person of interest in connection with the blaze, but did not provide any other details.